When GameChange Solar was formed, its goal was to, well, change the game in racking. The game in particular the company has changed is that of levelized cost of energy by offering some of the lowest priced fixed-tilt mounting and racking systems in the industry. The N.Y.-based company is ready to launch the next step in its product evolution with the Genius Tracker. The issue with a decentralized tracker is often that upfront cost. The technology that makes them go is often expensive and you need a bunch of them distributed throughout a site. But in sticking with its philosophy, GameChange’s Genius Tracker comes in at a lower-than-normal cost — so low that it comes at a lower price point than the Power Tracker. In addition to the cheaper controller, the Genius Tracker is also notable for the proprietary way it is able to absorb vibrational excitation, according to Andrew Worden, CEO of GameChange Racking. GameChange put the system through wind tunnel testing at CPP to prove it. The system also hits 99.3 percent panel density, according to Worden. 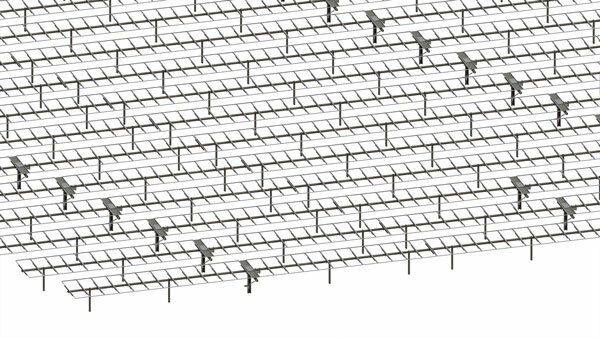 Most other tracker systems require a small space in between rows or every eight to 10 panels to accommodate either the centralized drive link or the bearing that tilts the row or a motor. The GameChange system only requires a 15-in. wide panel every 60 or 70 panels to power the motor, which also means there is no vampire drain on the panels themselves. Another key feature is the plug-and-play wireless connectivity. “It comes in on the truck, you install the controller, install the motor, install the panel and an hour later it turns on and starts running,” Worden said. No wires or manual inputting, it just autoconfigures and starts running. Worden expects Genius Tracker to be a big part of GameChange’s business from here on out, estimating it will outsell Power Tracker eight to one this year and 50 to one next year. And more broadly, as the tracker market heats up, Worden expects 1.2 GW of fixed tilt this year and 400-600 MW of tracker, and in 2017 he expects fixed will be around 1.7 GW with tracker business surpassing it. “Our model with tracking is to change the world by making solar energy affordable,” Worden said. “We’re not trying to charge a little less to maximize profit. We want to really move the needle in the cost of solar and we need to make a good margin so we can grow.